“The child feels important and loved. He or she has an opportunity to model parent’s behavior. The parent can observe and learn about the child’s strengths and weaknesses in order to better guide them. The child has a chance to voice their thoughts and feelings. Spending time with your child is easy when they’re younger because they are more than happy to play Candy Land with you for hours. When they are teenagers however, this can become more difficult as most likely they would rather spend their time with friends. To help maintain that essential quality time with your child, here are ten team building activities that you can do together as a family. Materials Needed: Paper, scotch tape, open space for flying the airplanes. What this Teaches: The benefits that come from hard-work. Give your family members 5-10 minutes to research how to make the best paper airplane. They can watch Youtube tutorials, or find step-by-step instructions on the internet. Then give them another 5-10 minutes to make their own paper airplane. Find an open space and take turns flying your airplanes. Mark how far each plane flew with a piece of tape and then reward the winner with some type of prize. Materials Needed: Step-stool or ladder. What this Teaches: Trust and Accountability Although this is a relatively simple activity, it can also be a lot of fun. Start out by having a member of your family stand on a step stool, facing away from everyone else. Then have the other members of your family stand underneath them and hold on to each other’s arms, once they have a strong bond tell the member standing on the step-stool to “fall” and then catch them as they fall straight backwards. This can be done from even greater heights once you’ve mastered the step-stool. Materials Needed: A sequence picture book. What This Teaches: How to communicate effectively and work as a team. Buy a children’s sequence picture book that your family is unfamiliar with such as “The Mitten” by Jan Brett and then cut out each page. Divide the cut out pages evenly between your family and then have them work together to put the book back together in the right order. Materials Needed: Paper, pencils, simple drawings. What This Teaches: How to give clear, concise directions and work with a teammate. Divide your family into groups of two and have them sit back to back. Give one teammate a pre-drawn picture, and give the other teammate a paper and pencil. Instruct the person holding the pre-drawn image to give instructions on how to draw their picture without outright telling them what it is. Come up with around 20-25 questions about your home and family and then have your family compete to see who can answer each question correctly, the fastest. 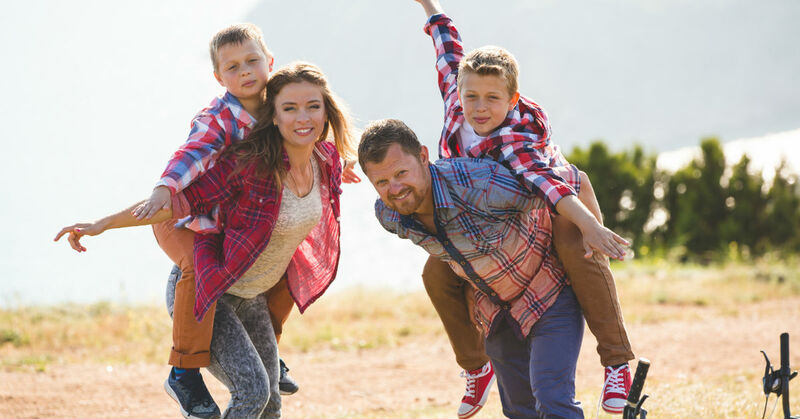 These can be questions such as, “What is mom’s favorite color?” or “How did Johnny break his collarbone.” This activity will be a lot of fun and is a great way to strengthen your family bond. Materials Needed: uncooked spaghetti noodles, mini marshmallows. What This Teaches: Teamwork and problem solving. Depending on the size of your family, split up into two or three teams. Give each family a box of spaghetti and a bag of mini-marshmallows and have them construct a tower as tall as they can within 10 minutes. Whichever team gets the tallest tower within that 10 minute time-frame wins. Materials Needed: Poster board, glue, family pictures, markers, an empty wall. Purpose: Family Bonding and Reminiscing. On a big poster board come up with phrases that can be illustrated through pictures, such as “birthdays”, “achievements”, “vacations”, “memories” and then as a family create a collage. Find a space in your home to hang this poster and continue adding to it. Materials Needed: Random household items, blindfold. What This Teaches: Trust, teamwork. Set up a “minefield” in your house by creating an obstacle course of chairs, pillows, couches, etc. Then divide your family into groups of two. Have one family member wear a blindfold while the other guides them through the minefield with only verbal directions. Have each family member take turns going through the obstacle course and guiding someone through it. Feel free to alter the obstacles after each turn so that nobody becomes too familiar with it. Split up into two teams and give each team a list of items that they need to find. This can be household items, or you can go even bigger and take your scavenger hunt across the whole city. These should be fun and silly items such as, “go buy a Slurpee and drink it until you get a brain-freeze” or “go to a park and do the monkey bars.” Make sure and get a picture or video of each item on the list so that you can all go through them together afterward. Within a hallway of your house, make a spiderweb by taping up many strings of yarn. Have your family members then take turns getting through the spiderweb without touching the yarn. Have competitions by seeing who can get through the fastest. Through these fun and simple team building activities, you will notice your family come closer together. You may even notice your teenager wanting to spend more time at home. Make a designated time each week where your family does on of these activities and you will be pleasantly surprised by the impact it will have within your home.